Our Portimão cruise port guide gives you information about the docking location, cruise dock, transportation options and much more! 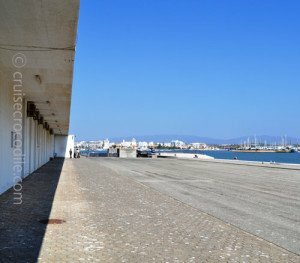 Welcome to the Portimão cruise port guide. Portimão is with 44.000 inhabitants the 2nd biggest city of the Algarve in Portugal. It is a city built in the 18th century, but already inhabited by many before that time. Here you will the old fishermen’s quarters, Portuguese 19th and 20th century architecture, the iron balconies, 15th century church, ceramics and tile work. The city itself is quite nice, but please know you are in the amazing Algarve. The Algarve is the southernmost region of mainland Portugal. It is one of the most popular tourist destinations in Europe and “Europe’s most famous secret” as they call it. Visit this port of call to enjoy white sandy beaches, scenic coastlines, historical villages and enjoy the good life. This is the cruise dock and tender pier in Portimao. This is the parking lot in front of the cruise terminal. 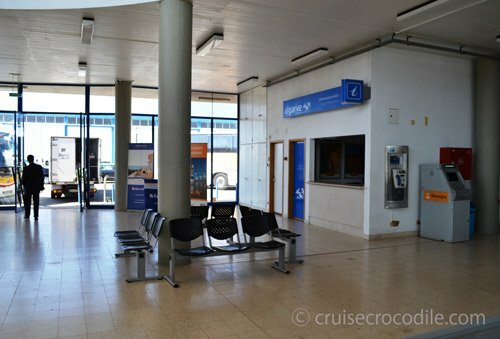 Inside the Portimao cruise terminal you will find a tourist information desk, snack bar and souvenir shop. Portimao cruise port is a quite difficult port to get into. Smaller ships are able to sail up the Rio Arcade and dock there. Most ships have to anchor at open sea and tender their guests ashore. The tender ride is usually about 2 nautical mile. Check with your ship if you are going to dock or tender. In both cases you will arrive at the same spot (see map above). From here you are about 2 km away from the city centre. The terminal where you arrive has good facilities like tourist information, souvenir shops, snack bar and car rental option (that is not always open). Usually your ship will provide a shuttle bus, ask them for the details. There are also taxis available. It cost about 5 euro to get to the city centre. You are also free to walk it. Other than taxi and shuttle there are limited opportunities when it comes to transportation. Therefore we highly recommend to pre-arrange something to make sure you get the most out of your day shore. This is a town for history lovers. Silver used to be the capital of the Algarve when the Moorish ruled the Iberian peninsula. Driving up to Silves you already realise this is something special. Castelo de Silves is the eye cather of the town. It is one of the best preserved castles in the Algarve. Find Silves about 18 km from port. The small scenic town of Lagos is filled with history. 2000 years of history can be found on the main street. Lagos is most famous for the spot where the ships of Henry the Navigator departed from. With about 30 ships they would sail from here to navigate the world. But also in 1444 this is where they built Europe’s first slave market. If you are looking for a little bit of paradise Carvoeiro is the place to go to. It is a scenic beach at this sea side port that is just picture perfect. 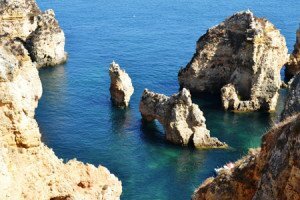 Right near Lagos you will find Ponta da Piedade. This is one of the most scenic coastlines in Europe because of its bizarre rock formations. The cliffs rise about 20 meters out of the water and this makes for very scenic pictures. It is a popular spot for photographers or people looking to discover the hidden bays and mysterious caverns with a kayak. Smaller ships will be able to sail up the Rio Arcade and dock at the Portimao cruise dock. Larger ships will have to drop anchor and tender you to the cruise dock. 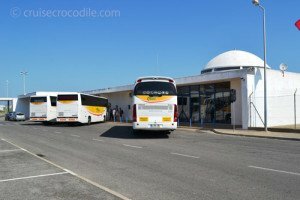 The cruise dock offers a cruise terminals with shops, tourist information and taxi stand. Shore excursion busses are waiting for your at the parking lot in front of the cruise terminal. The Portimao cruise dock is about 2 km away from the city center of Portimao. Check out the full Portimao cruise port guide for all the information.